I still need to catch up with my Christmas cards, I just didn't quite have the motivation. 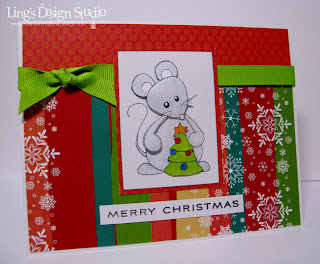 Instead of forcing myself to make Christmas card, I decided to do all occasion card. I made this card using Paper Crafts Go-to Sketch # 8. 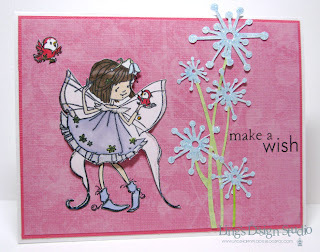 I love working with fairy images, especially one that as sweet & cute as this one. Well folks, that's it for today. Tomorrow I'll be back with new challenge from My Grafico. Have a great Tuesday! Wow, I think I really enjoyed my break to the max! Granted there's many things that I want to do that still didn't get done, but it sure felt great to lounge around and watched some cheesy Christmas movies. On top of that, I did get most of Christmas shopping done. My in-laws called yesterday to see if we would go with them to Katy Mills mall, I said okay immediately. LOL, hubby thought I was the only one that have to go. His dad made him go, too. Hubby desperately trying to came up with several excuse for him not to go. He felt better when his dad showed up and said they'll do happy hour while his mom and I went shopping. Yeah, when it comes to shopping, I'd rather go by myself than with hubby. I don't like people waiting on me cause then I feel guilty. And, another important thing that happened during the long weekend, Lori, her husband Carlton, & daughter Sarah delivered Caring Hearts cards package to Baton Rouge Caring Center. Here's Lori with Lynette the activity director, sorting the cards out. She said that the residents were excited when she showed up and can't wait to see what she brought over. It feels so great knowing that our little hobby can help brighten people's day. Now, on to card for today. I made this card for Lucy's challenge of using something old. 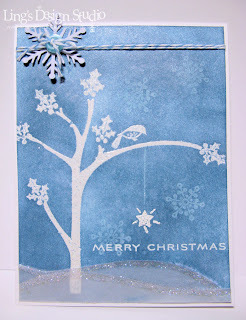 That vellum with snowflake background has been on my scrap stash for a few years. If I'm not wrong it was part of Christmas party invitation that I made for Lori back in 2004 or 2005? Can't remember. So, did any of you taking advantage of the Black Friday shopping? I ended up ordering some Copics from Scrap-mart and stamps from Simon Says Stamp. Anyway, today back to reality. Back to work. Hope you all have a great Monday! Cheers! Hi peeps! How's your Thanksgiving weekend going? I ate way too much on Thanksgiving day. What can I say, hubby, my sister-in-law Kristen, and my brother-in-law Mike are such good cook. Hubby made seven layer salad, Kristen made this super delicious brocolli caserole (and I usually don't like brocolli), and Mike did the turkey. Then for desert we had pumpkin pie & creme brule. Soooo yummy! And, I do enjoying my long weekend and break from work. It's nice to chill out at home. On top of that, yesterday, I was so excited that I got to spend a couple hours hanging out with Trinh and just stamping. 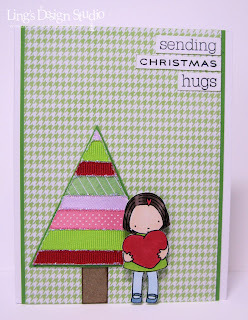 She brought her Hero Arts stamps for me to use and she used my Papertrey Ink stamps. We both were so busy chatting and just ended up stamping a bunch of images, without completing any cards. Love it! 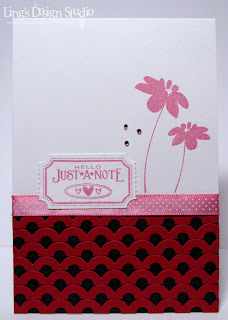 I so wish my friends that do stamping live close by instead of in another city, so we can get together more often. :) Thank you, Trinh for coming & see me. Truly enjoy it hanging out with you! 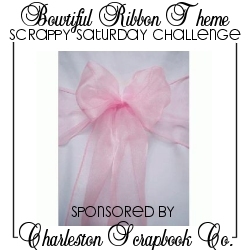 Now, on to Wee Memories "Ribbon" challenge for this week sponsored by Charleston Scrapbook Co.
See, while I was cleaning up for Trinh's visit I saw my pile of short ribbons, that basically too short for anything, but perfect for die cut. I just glued all the random ribbons on a piece of cardstock & then cut the tree shape out of it. Check out all the awesome creations by the DT here. Well, that's it from me. Still enjoying the rest of my long weekend. Love it. Cheers! Anyway, here's a quick card for you. Really loving using baker's twine right now. Also, I want to mention really quick, sweet & talented Tiffany (I Heart Art) is doing a giveaway here and hint... hint... it's a generous one. Go check out her blog. Well, I am taking day off from blogging tomorrow. I wish you all a very happy and blessed Thanksgiving day. Enjoy your time with the family. Thank everyone for your visit to my blog, for your encouragement along the way, and for your friendship. 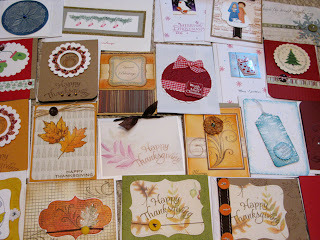 I am so thankful and grateful that through blogging and card making I have met so many wonderful, amazing girls. I am thankful for my life and for all the blessings I have received. HAPPY THANKSGIVING! Good morning people! How are you doing? Are you already off for the holidays? I am so looking forward to my days off. I've been looking at lots of scrapbook layout lately & really want to get back on doing some layout. 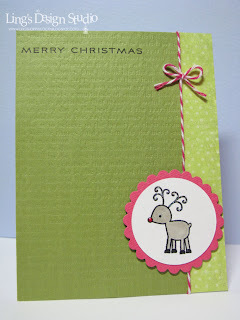 So wish I have time to do both card making & scrapbook. 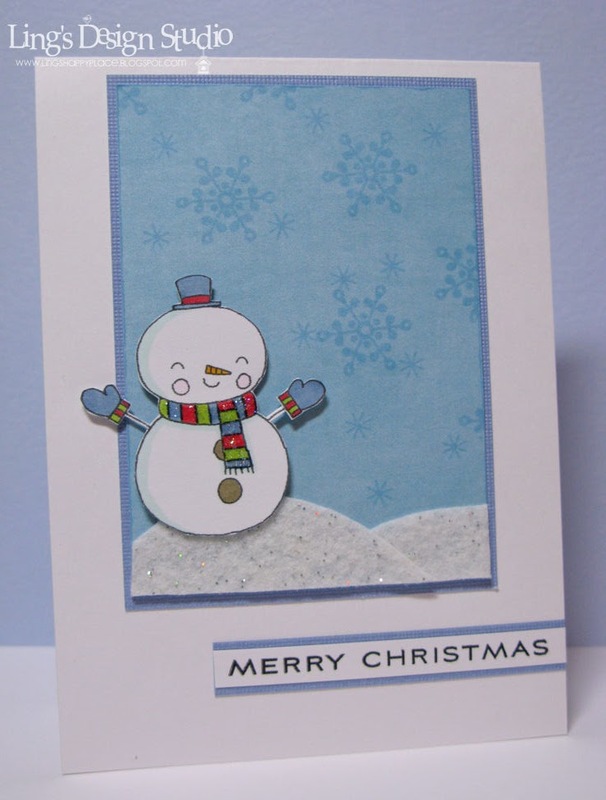 A couple weeks ago, Tamara from Stockberry gave me this cute snowman to make card sample with. 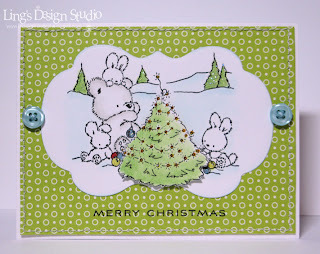 It's been a crazy couple weeks, so slightly late, but here's my card using CPS sketch. I better stop rambling. Tend to ramble too much when I am excited. You know, I've been following CASE Study challenge since they first started and always want to play their challenge, but somehow I often missed it. Granted, the last few weeks been so crazy busy for me. But, I am happy to say that I get to play this week! Yay for me. Mojo slowly but surely is coming back. Many of you already contacted me to claim your prize for Caring Heart Card Drive. For the rest who hasn't claim it, you have till Friday to contact me! That's it for today folks. Hope your week starts great and for those of you who travel to be with your family, have a safe trip. Cheers! Happy weekend everyone! 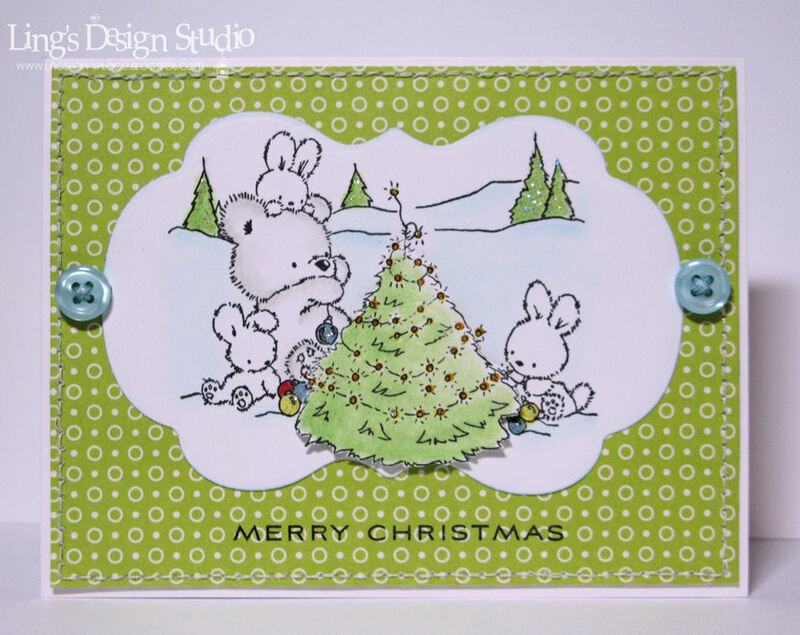 Welcome to Wee Memories blog hop! So glad you can join us this week. If you come here from VIRGINIA then you're on the right track. If you miss anyone you can always go to Wee Memories for a complete list of the DT peeps. 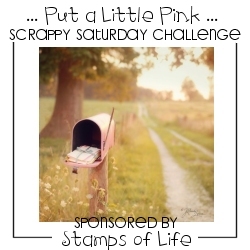 Our theme this week is "PUT A LITTLE PINK" and we are sponsored by Stamps of Life. 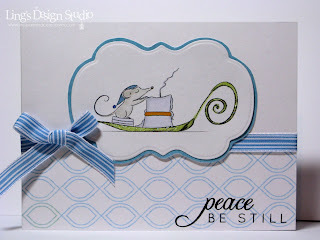 Here's what I came up with inspired by Moxie Fab Tuesday Trigger. I think I need to do major cleaning of my scrap room to really get my mojo to come back. This past couple weeks, my room looked like a hurricane went through a mail room. 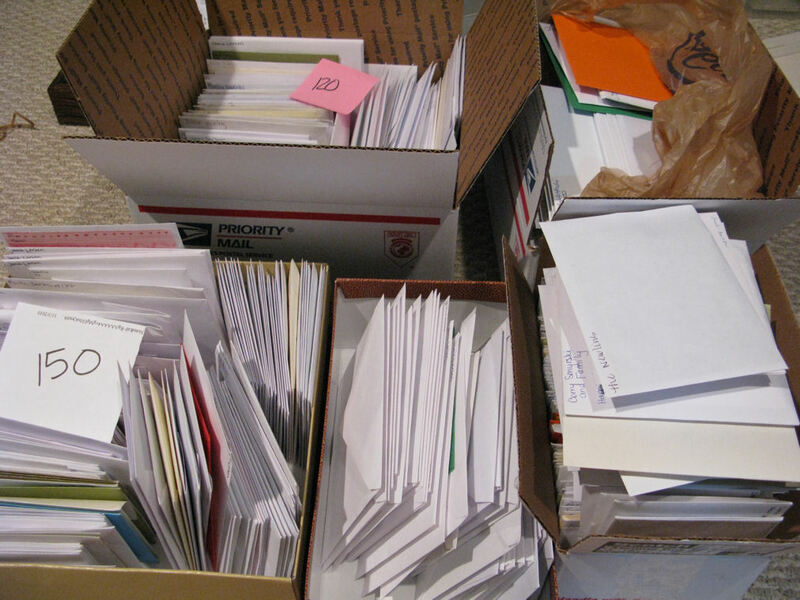 LOL, I sorted & packaged all the cards for the card drive in my scrapbook room, that literally I had to tip toe in between all the packages before. Now it looks a bit more decent, but not as clean and organized as I like. So, mission for today is to go through my room top to bottom and clean everything. Besides, my lovely card maker & blogging friend, Trinh is coming the day after Thanksgiving and we're going to do some cards, so I need to get my room in shape. Nothing like having visitor to make the house looks all sparkly. Hah. From here, your next stop is the sweet & talented SIMONE. Thank you for stopping by and looking forward to your creations! Have a super duper great weekend! Cheers! Caring Hearts Prize Winner List!! As I sorted through and packaged all the cards that I received for Caring Hearts Card Drive, I feel so blessed to have met you all my card making/blogging friend who's been so generous in your support. In 6 short weeks, we have collected 773 cards! HOW AMAZING IS THAT? I am so very grateful that so many of you cheering on this card drive along the way. I feel all warm & tingly just thinking of the reaction of the people who will receive your fabulous creations. 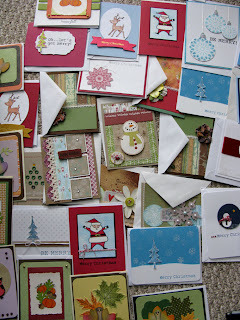 And, I do have some extra cards since we receive so many Christmas cards. No worry, all cards will go to good cause. My mom volunteered at an austism education center in Jakarta and I hope you don't mind that I will be sharing some of the extra cards with the kids over there (I'm going home to Indonesia in December) as well. First, I hope you know how I wish everyone can win. Although, I do think everyone win something by participating simply by knowing that your random act of kindness brighten someone's day and bring joy to their holiday season. To thank everyone for their participation, Mami Doodles has generously offered this FRUITY THANK YOU. YOU CAN DOWNLOAD THIS FOR FREE FROM NOW TILL THANKSGIVING. 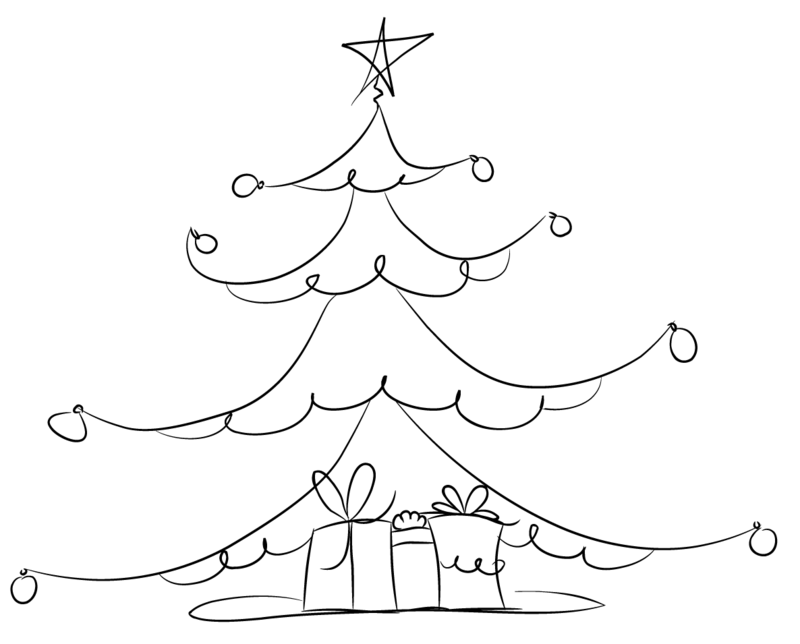 There's also a CHRISTMAS TREE from Just Somelines that you can download for free. Winners you have 1 week to claim your prize or another winner will be selected. Again, thank you to everybody for the help, support, encouragement, and participation. Truly, this card drive is successful because of you. I couldn't have done this without you. THANK YOU SO MUCH! I hope you will join me again next year and let's do it bigger & better! Let's reach more nursing homes and I will try even harder to find more sponsors. YOU ALL ARE SO AWESOME!! I'm so blessed to have known you all through the blog land! Hugs!! Hi all! 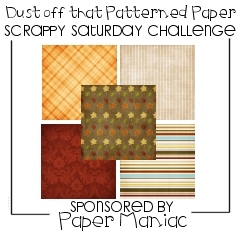 Today is time for a new Paper Play Challenges. 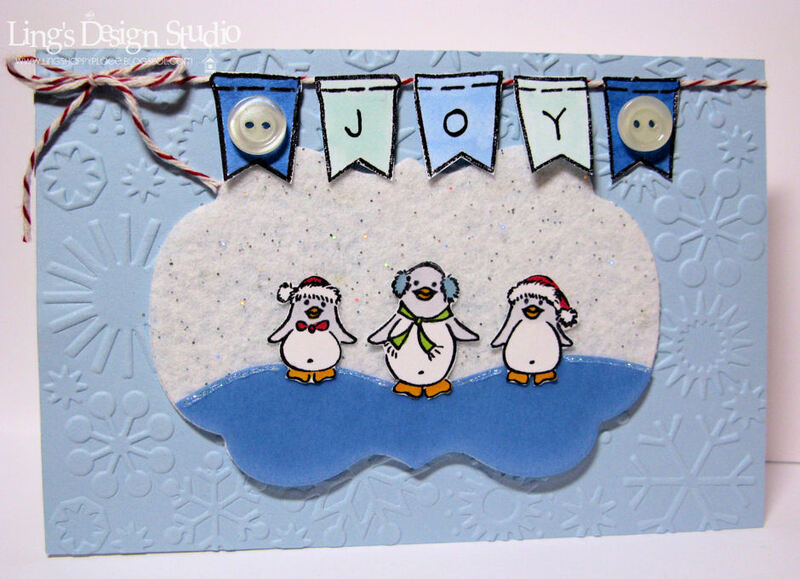 This week our talented Heather Maria set the theme of "LET IT SNOW, LET IT SNOW, LET IT SNOW". 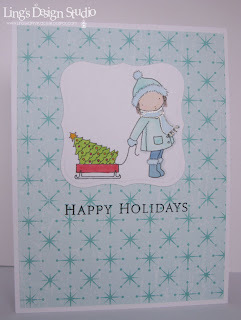 For my card, I decided to play with Papertrey Ink Merry Little Christmas set and the distress ink. I am not sure how I feel about this card. LOL, I guess I am so used of my cards has so many colors on it lately, that just blue & white kind of throw me off a bit. 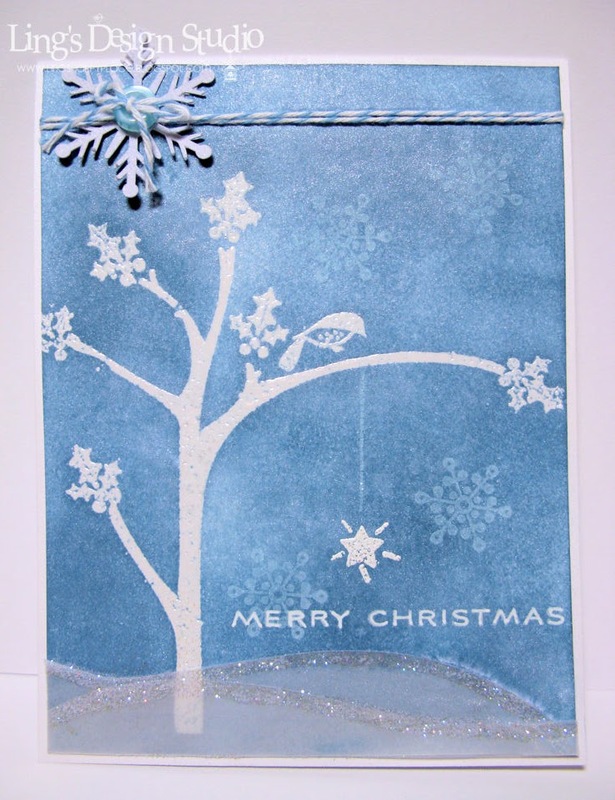 This card is very shimmery actually, as I sprayed it with perfect pearl to finished it off. 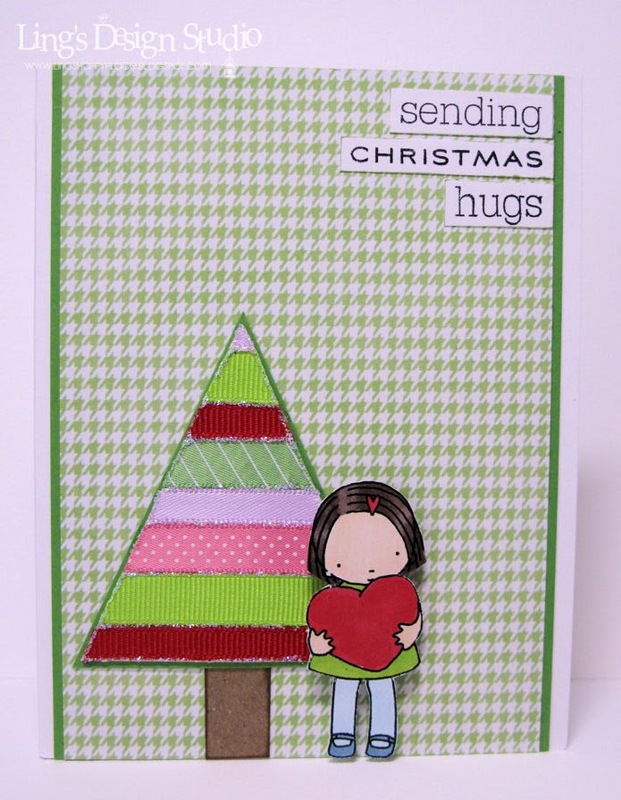 Check out all the amazing cards by Paper Play DT here and I hope you will join and play with us this week! 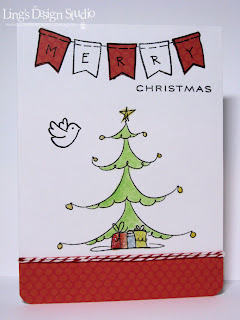 The sad thing that happened after I made this card was that I lost that bird during cleaning. I have several clear stamps that I want to clean, so kind of just grab a bunch of them and wash them and this little bird slip out of my fingers and I saw it caught on the edge of the drain and as I tried to grab it, plupp...... there it went down the drain. Bye, bye birdie. Hubby was so nice trying to find it back for me by taking apart the drainage, etc., but no such luck. So irritated with myself for being sloppy. Note to self, don't clean stamps when you're tired or sleepy!! On happier note, look at this lovely packages. 2 boxes already been mailed out to Baton Rouge, Louisiana & New Jersey, for Lori & Ren-Yi to drop at the nursing homes by their place. I will hand delivered for the one in Houston on the first weekend in December (they will receive the Christmas cards as we only have enough Thanksgiving cards for 3 places only). Then, after work I went & picked up some more cards for Caring Hearts Card Drive. Here's some of the cards that came in. All I can say there's so many talented ladies out there. These seniors going to be sooo happy to receive your gorgeous cards. Meanwhile, here's a list of the Caring Hearts participants. Or you can simply click the tab that says Caring Hearts on the top part of my blog. If you don't see your name please let me know ASAP byThursday noon the latest. Door prize winners will be announced Friday, 11/19/10. 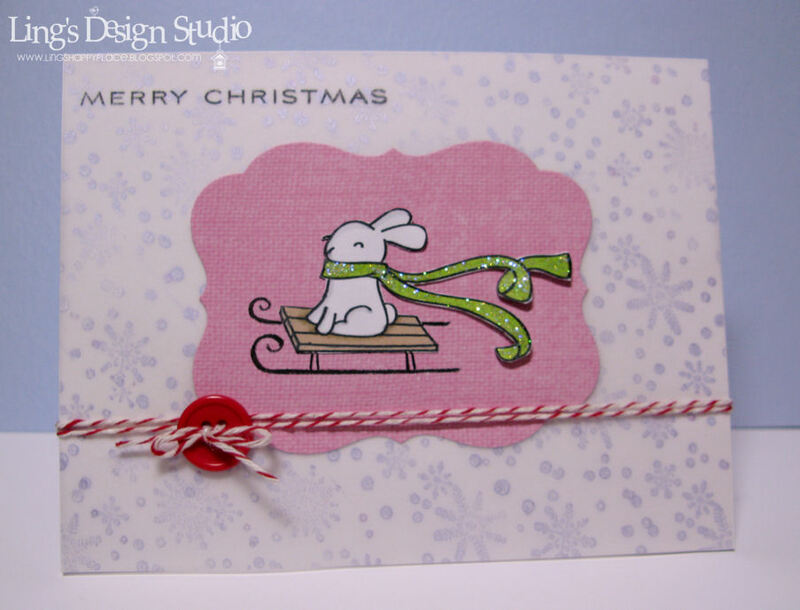 I wish I could give everybody a prize for sending their cards, but since we only have certain amount of door prize, Jehanne from Just Some Lines has graciously donated this digi stamp as a thank you gift from me and her to all of you who participate for this card drive. It's nothing big, but I just want you to know how much I appreciated you all for everything. Simply click on it & save the file and it's ready for use. Please leave some love for Jehanne by checking out her store or her blog here. 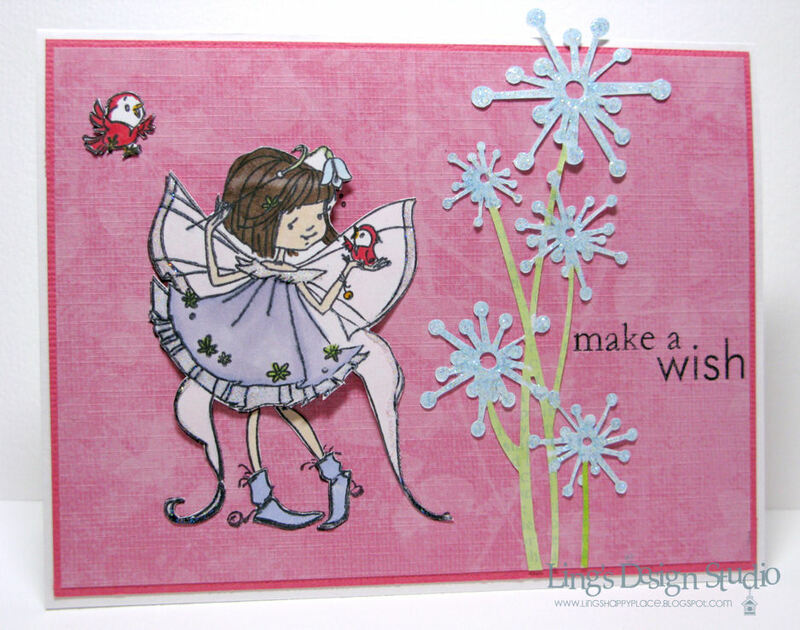 She has many whimsical & cute digi stamps. Here's a couple cards from me. The first one using this cutie patootie "Goodnight Mouse" also from Just Some Lines. 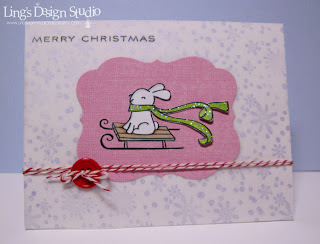 That border was made using the stamp set that I won from Mint Motif. Love it! 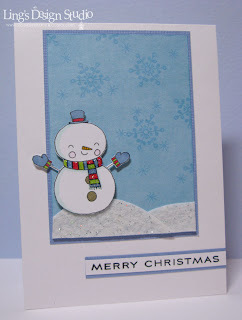 My second card using the tree freebie. I hope you enjoy your visit here today. Have a blessed Tuesday! Today marks the last day of Caring Hearts Card Drive collection. From the support of the companies & people that donate the prizes, to the people who sent tons of cards, this whole journey has been so amazing. I am so touched by everyone's kindness and hopefully many of you will join me again next year as I plan on organizing this event annually and who knows, maybe next year we can do it bigger & reach more places! Here's a peek of some of the cards that came in this past week! 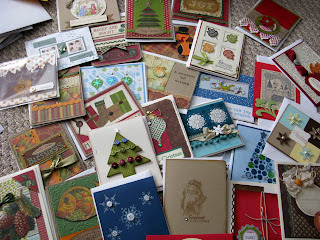 Tons of gorgeous cards that for sure will brighten so many people holiday season! 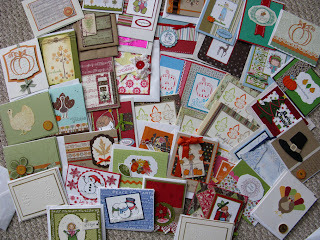 THANK YOU to each and every one of you for your wonderful cards. I haven't check the mail box today, and I am sure there will be quite a few more coming in as I have several people notified me that they just mailed their packages this past weekend. 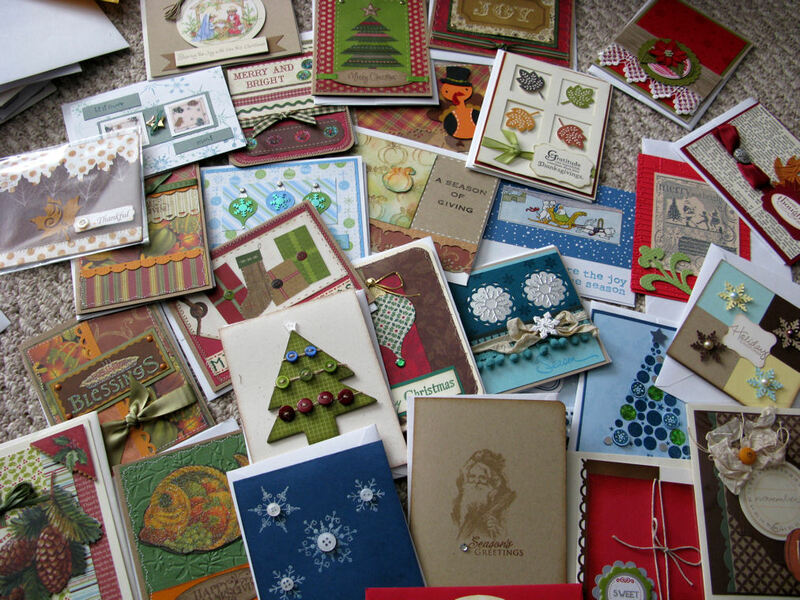 For now, we have reached at least 525 cards and that just from the one that came in. Plus mine we have at least 580! 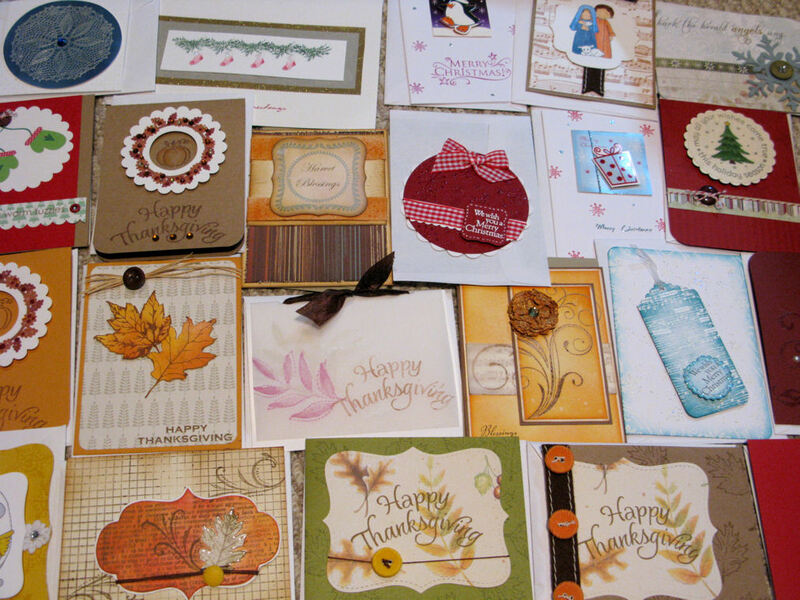 Before I was short on Thanksgiving cards, now I have enough to send the cards to at least 3 nursing homes! Yay!! 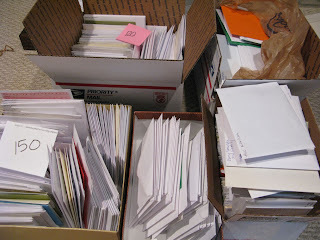 This weekend I was busy sorting & counting all the cards. Make sure all the entries are counted for. Since we have so many entries, I decided to have winner for each prizes. I created a list from all the entries and will let random organizer do the job of picking the winners. I will announce winners for the prizes this Friday. So make sure you check back then! Now, as I told you before my mojo has been on vacation. And, honestly I am still struggling a bit. I think I was just a bit overwhelmed with everything that's going on right now. Anyway, I do have this image colored from a few weeks ago. So, all I need to do was adding some patterned paper and some stitching. Since, my sewing machine is kaput, I decided to be crazy enough to do hand stitches. Yeah... that's not going to happen often. 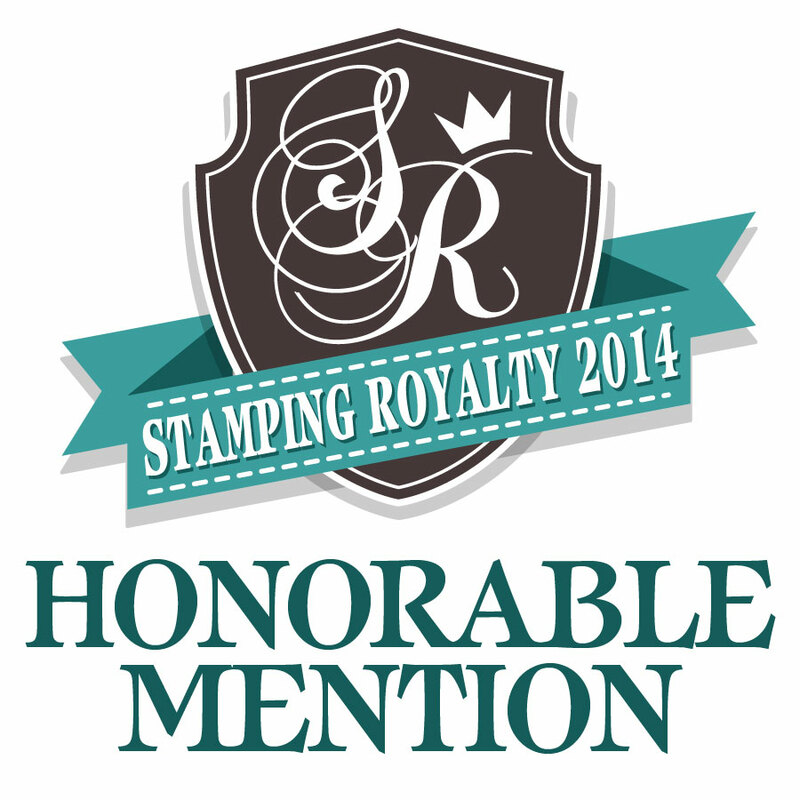 :) I love, love Lily Of The Valley stamp. Their stamps are just so sweet & adorable. Okie dokie, that's it from me today. BTW, does any of you order the latest release from Papertrey? What did you order? Sigh... I really want to order, but still debating. So many stamps, not enough $$. Hah...how do you decide what to order each month. There's so many companies and they each have new releases every month! Oh well, I better go before I start rambling all over the place. :) Hope your week starts off great! Hi all! 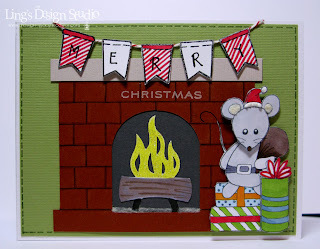 Happy Sunday and welcome to Denami Christmas Blog Hop! If you come here from the sweet & talented PAULINA then youre' on the right track. If you miss anyone, you can always go to Denami Blog for a complete list of the hop participants. 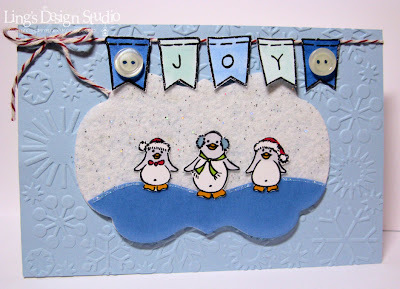 This month the theme is Christmas and of course, I have to use the penguins! You know me, I can't resist cute! Besides, one of my favorite animation is Happy Feet! Hah... so here comes the penguins. Hi all! Are you ready for a new Wee Memories challenge? This week it's all about patterned paper. 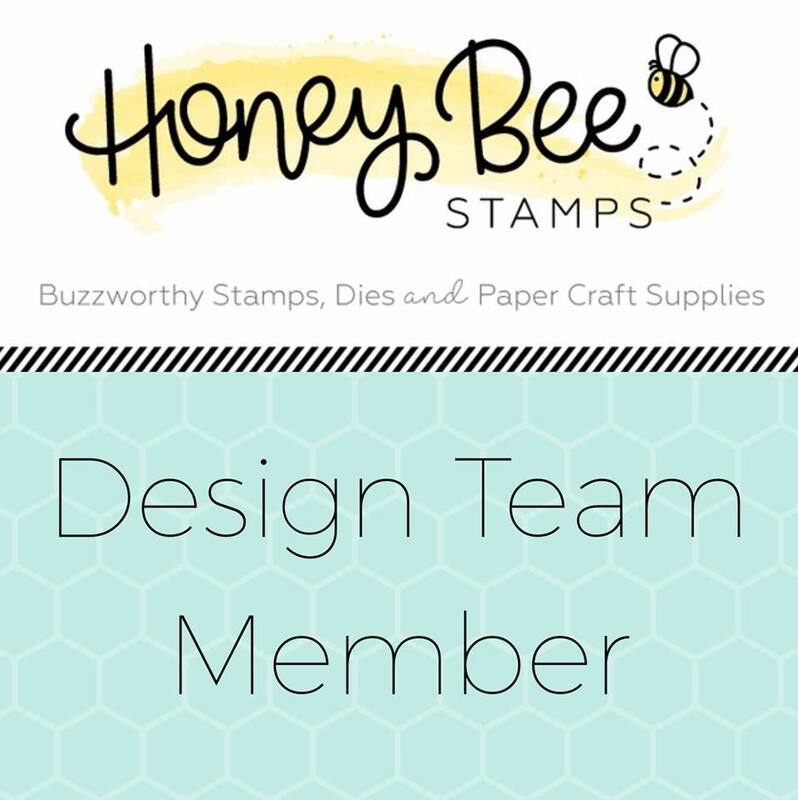 We are sponsored by Paper Maniac and you can check out all the challenge & prize details, plus the awesome eye candies by the DT gals here. For my card, I made this CAS looking card. Most of us use patterned paper anyway on our card making, so this should be an easy peasy challenge and I hope many of you will join us. Looking foward to your creations! On another note, as of yesterday we're almost reaching 500 cards for Caring Hearts Card Drive! Thank you, thank you, thank you! I am continue to be humbled by your generosity. I had to go back and forth twice to pick up all the packages from the mail box to my car. I had to contain myself not to jump up and down when I opened the mail box and saw the pile of packages. And, Ann Kikuchi from Anchorage, Alaska got me teary eyes with her note. She included a small donation to help me with the mailing cost. The simple gesture of kindness means so much to me. Ann, thank you so much! I say it before and I will say it again, I am so grateful for each and everyone of you who supported this card drive. It's successful because of you all. Today is Mami Doodles day! We have new challenge for you. Our challenge run for two weeks, so you have plenty of time to join. The theme is soft & fuzzy. 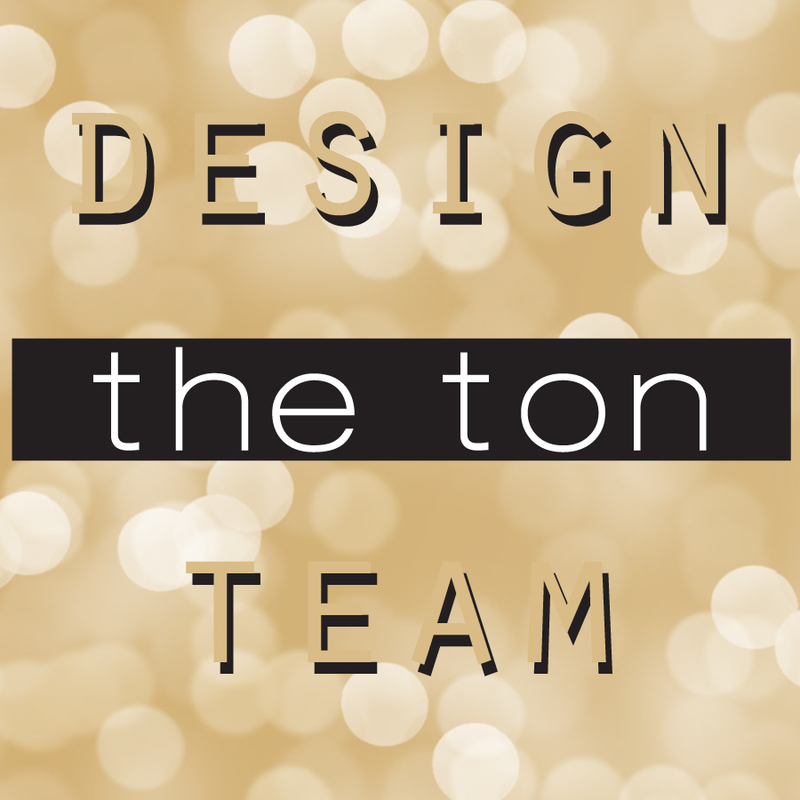 Create any project using something soft & fuzzy, it could be felt, flocks, etc. Here's my card using the cute Mr. Mouse. And Mr. Mouse is Mami Doodles promotional item for November. You can get this set (3 images in this set) for free with any Mami Doodles purchase. I used flocks on the fireplace to resemble the ashes and on the ears. You can check out all the DT creations here. My mojo is still sulking. Hubby acted surprise when he saw me just curled up on the sofa last night and said wow, you're actually relaxing and not making cards? Hah... Managed to finish this card though. Another card I made with Mr. Mouse. This one just for fun. Hmm... my mojo decided to go on vacation without notice. So, here I am stranded with no inspiration whatsoever. I haven't been very happy with some of my cards result lately. Since my mojo goes of to la-la-land, no card from me for today. But, I have some eye candies from some amazing & talented ladies who totally brighten my day with their generous support for Caring Hearts Card Drive. Here's another peek of some of the cards that I got in the mail yesterday. Some of the gals included very lovely cards for me, too! Thank you ladies for the beautiful cards! 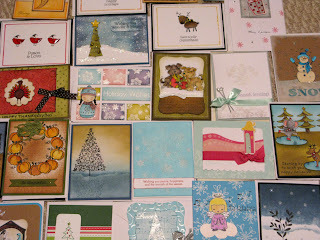 Here are their cards and link to their blogs, cause these ladies are so talented! You'll find many inspirations on their blog and leave them some love will you, for all their support for Caring Hearts Card Drive. 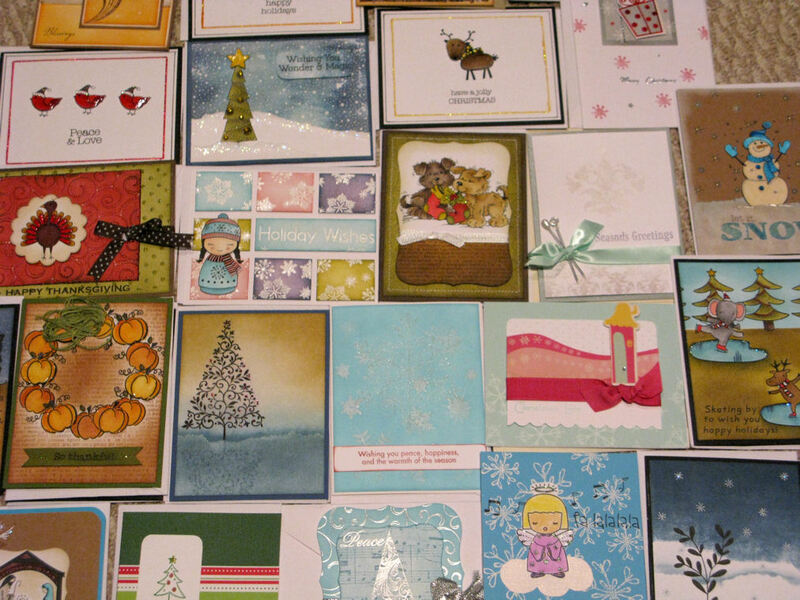 I also have to do a shout out for the amazing Leesa Berry who so sweetly mailed me 52 cards! 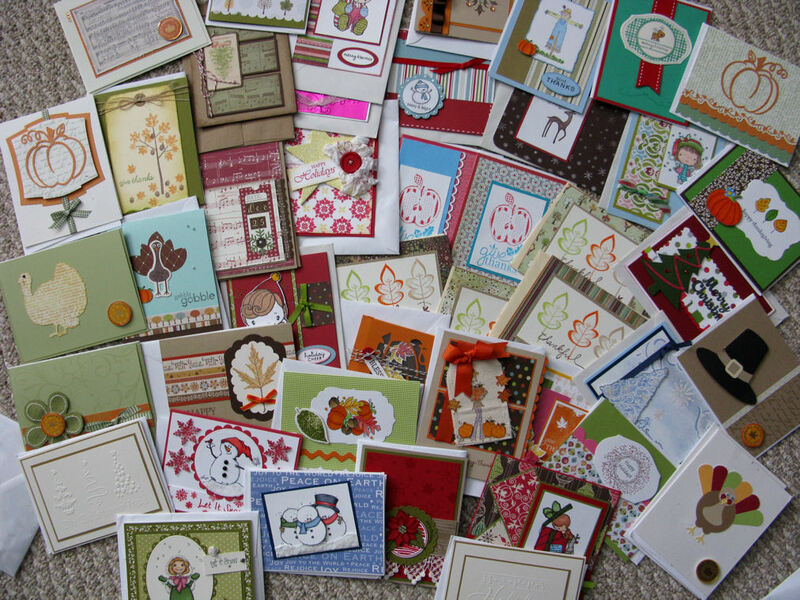 She already sent me 40 and when she heard me needing more Thanksgiving cards, she stepped in and mailed more. Thank you, Leesa! I appreciate each and every one of them. Thank you all so much for everything. Thankful to be surrounded by kind & generous people like you all. Hugs!